House of Tricks is a well-known oasis in the middle of the bustling Arizona State University campus. Surrounded by trees, this little 1920s bungalow has a fire pit, bar, and open patio seating making it perfect for a quiet and tasty retreat. Robert and Robin Trick opened this fine dining restaurant way back in 1987. I am sure they have seen so much change with how ASU has grown around them. The seasonal menu changes regularly and they are known for using only the freshest ingredients from local sources. The DDs have got some mad culinary skillz, yo! For the second time, we gathered together to put our foodie adventure lessons to use and made some scrumptious treats to share with everyone. Hosted again by the amazing wine- and beer-pairing duo of Fred and Pat, we devoured our way through a four course meal with each course sporting its own beer and wine pairing! My personal favorite was the Mollydooker, but that was an unfair advantage. Mollydooker always seems to be a winner in my book. One of the fun standouts was Jenn’s deconstructed lasagna served with mascarpone cheese in addition to ricotta. She learned this little trick from our neighbors in the North and it provided a nice escape from the expected. Ann and Jay, Don and Jen, and Kelly and Tony outdid themselves with the appetizers. Don and Jen’s salmon ceviche was light and refreshing but not fishy. Delicious! Ann and Jay brought the crostinis with sun-dried tomato jam, baked shrimp scampi and asparagus wrapped in prosciutto. Tony and Kelly treated us to a caprese salad and blue cheese stuffed mushrooms poised on a crunchy pedestal for the perfect mix of flavor and crunch. With so much goodness, we were almost stuffed by the time dinner came around. The Buccatini alla Amatriciana was light for a summer dinner but with some spice from the chili flake to wake up the taste buds. Tony and Kelly’s two options of spicy and sweet Italian sausage were tender and juicy after cooking all day in a flavorful sauce. What a nice addition to Jenn’s lasagna. We were so happy Karna and Fred made it to the smorgasbord even after a super long flight home from frolicking through Europe. The Black Forest Cake didn’t make it to the table but we did wrap up dinner with a sampling of rich and decadent cheesecake flavors. Again we had such an amazing dinner and it was a fun departure from our normal routine to have a delectable dinner at “home”. This month, the Double D’s were treated to a new experience. We gave up our control to the chef and let him surprise us with the manifestation of his tasty imagination. 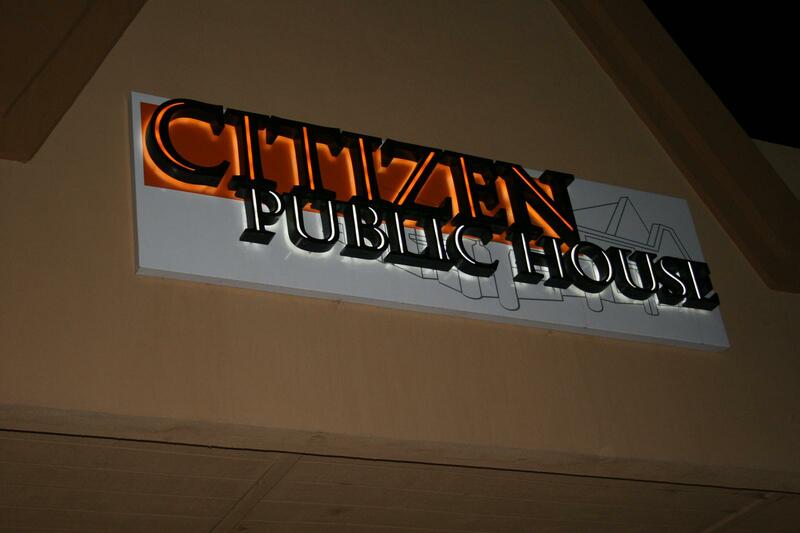 We experienced our culinary adventure at the Citizen Public House restaurant in downtown Scottsdale with the assistance of the amazing Gina who made us feel so welcomed. 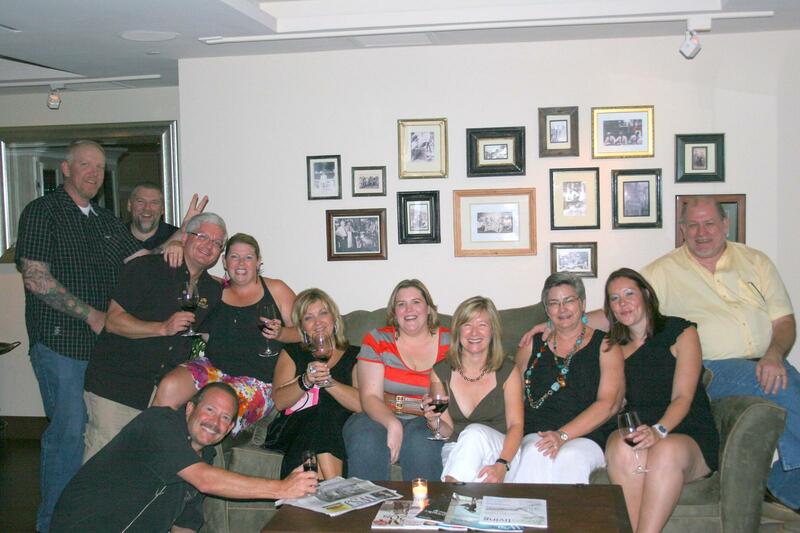 The restaurant, which calls itself a contemporary upscale pub had a very modern and fun yet relaxing atmosphere. Amy (not short for Amanda) provided us with amazing service as we traveled through our courses with coordinating wine parings one by one. 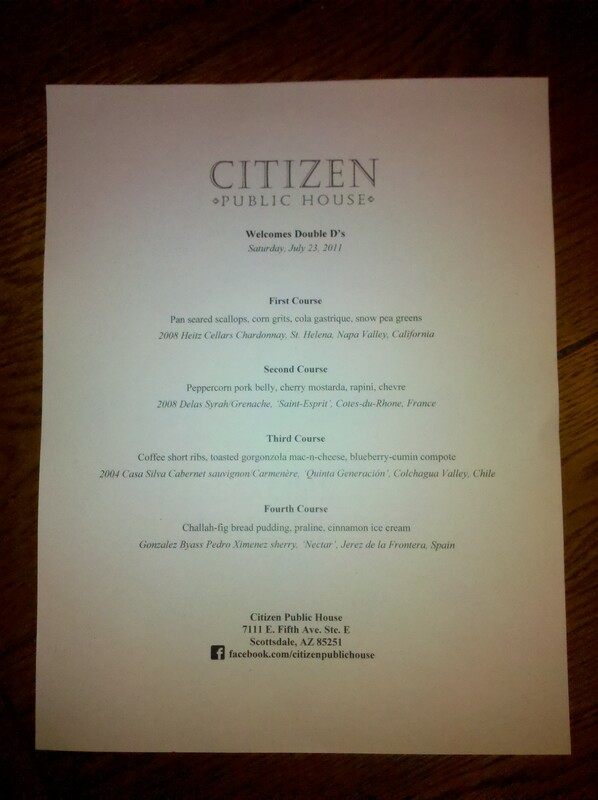 Chef Bernie Kantak spared no imagination when he created a menu especially for our group. First we started with pan seared scallops, corn grits, cola gastrique and snow pea greens. These scallops had an amazing flavor and were huge! A clear favorite for the scallop lovers in the group and paired with a 2008 Heitz Cellars Chardonnay, St. Helena, Napa Valley, California. Second we savored peppercorn pork belly with cherry mostarda, rapini (also called broccoli rabe) and chevre (french for goat cheese). The pork belly was extremely tender and was able to produce audible sounds of pleasure from some of our table. The dish was partnered with a 2008 Delas Syrah/Grenache, ‘Saint-Espirit’, Cotes-du-Rhone, France. Next we enjoyed coffee short ribs, that literally fell of the bone they were so tender, with “not your childhood” toasted gorgonzola mac-n-cheese, and blueberry-cumin compote. A little bit heavier than the other dishes but not light on flavor, this dish received rave reviews. The blueberry-cumin compote was a surprising choice that did not disappoint and the whole dish was paired with a 2004 Casa Silva Cabernet sauvignon/Carmenere, ‘Quinta Generacion’, Colchagua Valley, Chile. Finally, we ended the adventureland for our tastebuds with a challah-fig bread pudding, praline, and cinnamon ice cream which produced even more audible sounds from some of the group as they believed they were entering a figurative heaven. The pairing of Gonzalez Byass Pedro Ximenez sherry, ‘Nectar’, Jerez de la Frontera, Spain was a little overly sweet with the pudding and even more so by itself, but the desert was still delicious and had a little something for everyone. This was a first for the Double D’s and one to be remembered for the great service, atmosphere, and scrumptious cuisine. Small location which makes for an intimate setting but with a good selection of wines to choose from and fresh dishes plus homemade desserts. Your mouth will celebrate the great flavors but picky eaters should beware. Making changes to the dishes may change the flavor creation so your “without this or add that” request may get denied. Instead, order a dish as it is created and sit back and enjoy the experience.